From all the European artists who immigrated to Brazil during or shortly after the Second World War and who contributed significantly to the enrichment of our visual arts, Mira Schendel is undoubtedly the name of greater importance. Born in Zurich, she also lived in Berlin, Milan, Sarajevo, Zagreb and Rome before immigrating to Brazil in 1949, settling in Porto Alegre. There are no records of any European artwork by her; she is said to have interrupted her philosophy degree in Italy and started her artistic production here in Brazil, as an autodidact. Schendel’s writings are essential to understanding the uniqueness of her work. Without engaging in art history, she resorted to psychology, science, knowledge, theology and philosophy to produce her work, always based on her own thoughts and aesthetic principles. Predominant in post-Plato Western philosophy, the idea of splitting, which is inherent to human nature – body versus soul, matter versus spirit –, is central to her work, often permeated with existential questionings or expressions of religious origin. Mira Schendel quickly evolved from still life forms to abstractionism and then to writings – calligraphy of immense beauty through which she recorded her thoughts and questionings. Without abandoning the word as an expression of thought, Mira later incorporated self-adhesive letters (Letraset) into such writings, not only as vehicles of meaning but as graphical elements of countless artistic possibilities. Experiences with transparencies, which allow the spectator to contemplate the two faces of monotypes, are ultimate displays of the depth and sensitivity found in her quest. 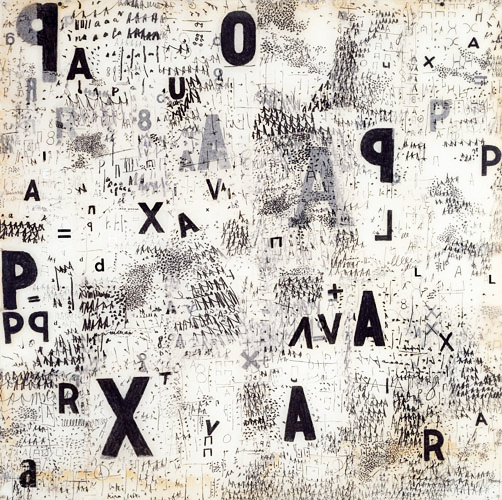 One can’t help recognizing and falling in love with the artwork of Mira Schendel. No one has ever transmuted the word into art with such elegance, delicacy and personality as she did. Even exceptional artists like Leon Ferrari (who shared with Mira the great retrospective ‘Tangled Alphabets’ at MoMA in 2009) and Marcel Broodthaers failed to unite, with such beauty, form and thought – body and soul, matter and spirit – and thus provide, through the contemplation of a work, deep thoughts combined with infinite pleasures.